This heartful book will have you in tears. In Awe of Being Human weaves tales of the seriously-ill children and adults who were Betsy MacGregor's patients together with descriptions of the soul-stretching experiences that physicians undergo in seeking to help people whose lives are at stake, taking readers deep into the challenging world of hospitals and the medical professionals who work in them. Betsy was a children’s doctor in a New York City hospital for almost thirty years, and her stories of serving the inner-city wounded are eye- and heart-opening. She really saw it all. And her voice is very kind. My aim in telling these stories is to offer a riveting glimpse into the world of hospitals and doctoring where so much intensity and depth exists. It seems to me that many people today are hungering for this—hungering to taste the unadorned reality of joy and pain, of life and death… These stories are intended to plunge readers into the sometimes unsettling but ultimately uplifting drama of life and leave them in awe at the miracle of being human. 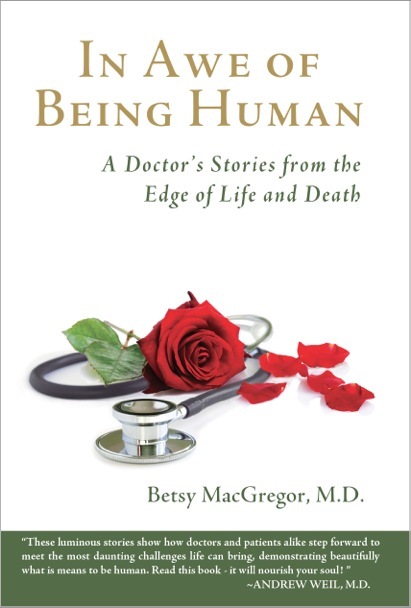 In Awe of Being Human weaves tales of the seriously-ill children and adults who were Betsy MacGregor's patients together with descriptions of the soul-stretching experiences that physicians undergo in seeking to help people whose lives are at stake, taking readers deep into the challenging world of hospitals and the medical professionals who work in them.